Microbial cockroaches: Effect of gamma-radiation on soil microbes – microBEnet: the microbiology of the Built Environment network. 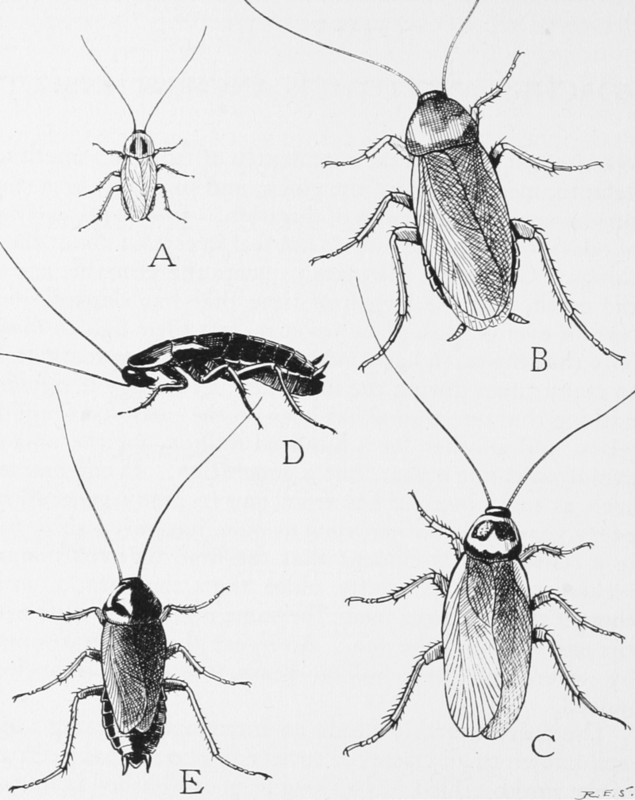 Cockroaches are often portrayed as the only organism that can survive a nuclear disaster. Indeed, Discovery’s Mythbusters team found that about 10 percent of a group of cockroaches could survive 30 days of exposure to 10,000 radon units of cobalt 60, a radiation strength comparable to that of the bomb on Hiroshima. Flour beetles apparently did even better (but were quickly forgotten), and the thought of these insects ruling the planet after a radiation event is slightly disturbing. So, what are the microbial equivalents of the cockroach? A recent paper in Applied and Environmental Microbiology investigates. In the introduction, the authors explain that ionizing radiation causes strand breaks in DNA, the generation of reactive oxygen species which can cause protein oxidation, and increased levels of electron donors. All of these processes are potentially lethal for most organisms, but, as we know, some microbes are capable of surviving extreme conditions. The bacterium Deinococcus radiodurans is known to be extremely radiation resistant. First isolated from a can of meat exposed to a high dose of radiation, its genome was sequenced in 1999. It has a very efficient DNA repair mechanism and each bacterial cell has multiple (4-10) copies of its 2 chromosomes. 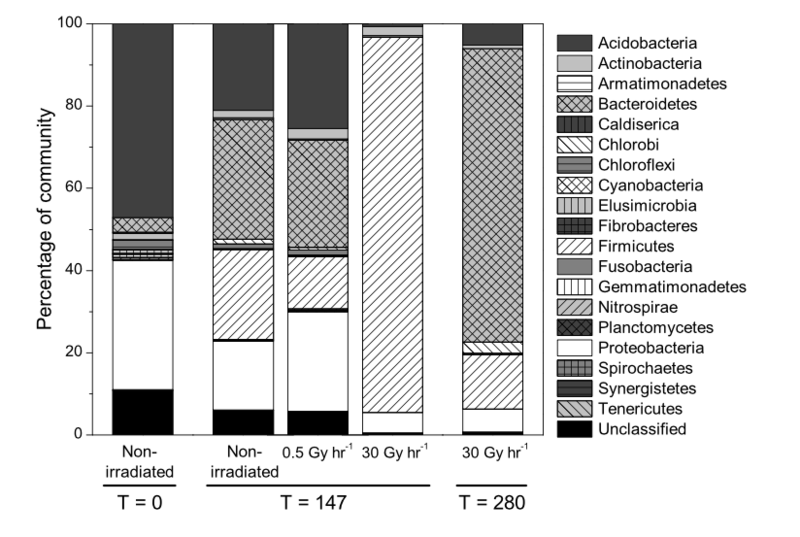 How complex microbial communities respond to irradiation, however, was not very well known. To study this, the authors of the AEM paper took sediment samples from the vicinity of the Sellafield reprocessing site. Sellafield, on England’s West Coast, was originally a plutonium production facility for nuclear bombs, but is now a commercial nuclear reprocessing site. It is reported as one of the 10 most radioactive places on earth. After mixing the sediment samples with water, the electron donors lactate and acetate were added to half of the samples. The addition of these compounds simulates radiation conditions, in which more organic compounds are available. Then, the soil samples were exposed to 0.5 Gy or 30 Gy per hour over a 56-day period (1 Gy=100 rad). After the exposure, the microcosms were stored for a another couple of weeks without radiation. Microbial diversity was determined by amplification and sequencing of the V4 region of the 16S rRNA gene. Before radiation, the soil samples contained 16 bacterial phyla, with Acidobacteria and Proteobacteria as the dominant taxa. The 30 Gy irradiation combined with lactate and acetate addition resulted in a dramatic decrease in overall bacterial diversity and a strong increase in Firmicutes. This increase was mainly due to 2 unnamed Clostridium species, one of which represented 83% of the total community at day 147 of the experiment. The authors hypothesize that Clostridia are capable of fermentation and endospore formation, which might make them more irradiation resistant than the other bacterial species in the soil samples. Subsequent incubation for another 5 months without radiation led to the reduction of these 2 Clostridium species in these microcosms, and an increase in Bacteroidetes. Appl. Environ. Microbiol. doi:10.1128/AEM.00590-15â€¨, Figure 3. Bacterial phylogenetic diversity in microcosms containing added lactate and acetate â€¨(final added concentrations of 7 mM each). T = time (days). In samples without added carbon sources, the result looked less dramatic. Here, initially Proteobacteria, then Bacteroidetes increased, with Bacteroidales species representing 37% of community after 147 days. The dominant species after irradiation in these samples were a Prolixibacter sp. and an unnamed Bacteriodales sp. The other parts of the paper describe the biochemical activities with a focus on Fe(III) reduction, which was increased in the low-dose irradiated samples. In summary, it appears that the soil communities responded very differently to the irradiation if organic compounds were added to the mixture. Weak points of this paper were the limited number of time-points, an unclear description of the exact experimental set-up in the Methods, and the absence of replicated experiments. With only one experiment per group, is not clear if the changes in the community were affected more by the addition of lactate and acetate or by the irradiation. There is no mentioning of the presence of Deinococcus sequences before and after irradiation, which is something I had hoped the authors would have commented on. Another possible weak point is that the experiment started with samples from a radioactive site, which could have led to the presence of a community that is already partially adapted to radiation at the start of the experiment. But it was nice to see how radiation appears to have these large effects on the community, and that, depending on the carbon concentrations, certain Clostridium or Bacteroidales species were able to thrive. I guess we can call them the microbial equivalent of cockroaches.